Today we’re happy to announce new versions of Movie Maker and Photo Gallery for Windows 7 and Windows 8. We’ve added a few new capabilities while also taking advantage of some advances in Windows 8. Movie Maker and Photo Gallery are two essential Windows applications hundreds of millions of people have come to rely on for making the most of your photos and videos. And with this release, we’ve given you a few more reasons to enjoy them even more. Windows Movie Maker is a great way to turn your ordinary photos and videos into a captivating story. Whether you’re making a short clip to quickly share or taking your time to make the most of that big event, Movie Maker showcases your skills as a budding film-maker. With major advancements in hardware accelerated graphics in Windows 8, Movie Maker has evolved to include these state of the art enhancements. Video Stabilization: Sometimes the video we take is just little too shaky; especially as we take more and more videos using our phones and smaller video cameras. Movie Maker has taken advantage of new technology in Windows 8 to smooth out your wobbly videos. Just select the shaky video and choose from a variety Video stabilization options and Movie Maker will smooth it out. Check out this wobbly video taken by a mountain biker with a helmet mounted camera. Movie Maker turns what is nearly impossible to watch into something that appears to be nearly professional quality. 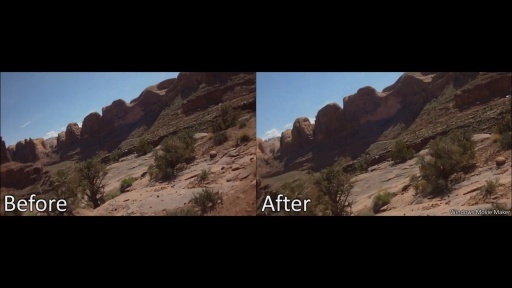 Video stabilization, courtesy of Windows 8, puts your shaky videos back on solid ground. Music: The one thing that can really make a difference in a movie is the soundtrack. But it can be hard to find not only the right piece of music but a version with the appropriate rights. And even if you choose a song from your own collection, it runs the risk of being stripped out once it’s published to YouTube for not having the appropriate rights. So we decided to work with AudioMicro, Free Music Archive and the Vimeo Music Store to make it easy to find music that is not only fitting for video, but also has the proper rights. Now when you go to add music to your movie in Movie Maker, you have the option of getting music from your PC or from three varied music services. So, you have the music but what about a way to control how well it plays with your videos. We’ve added waveform visualizations to both the music track and your videos so you can quickly see where you need to cut or trim your video to match your music. And if you want to narrate your movie, we’ve also added a third audio track for narration. Often times the easiest way narrate a video is to talk while you’re taking a video, so we’ve made it possible to add narration either as an audio file or as a video file. When you want to add narration to your video, just select the video with narration and we’ll strip out the audio and include it in the narration track. Of course, if you just want to record your voice using your PC, you can do that too. With sound coming from three different sources, the audio of your movie may be hard to hear. So, we’ve added some ways to choose which form of audio you want to emphasize. This makes it easy to clean up and enhance the audio for your entire movie project with just a single click. With enhancements to audio and music support, we’ve made it easy to find, add and control both music and narration. Now you can make your movies even better with great music from partners who specialize in music for film and film makers like yourself! Text Effects: Including text in movies continues to be a popular way to add depth or highlights but sometimes the font can get lost making it hard to read. One way to enhance the text is to place an outline around your text. Now when you add text in Movie Maker, you can also add an outline that makes the text stand out from the background. H.264 by default: One of the most popular video formats out there today is h.264 which is rapidly becoming the default format for cameras and video sharing. Now Movie Maker saves to this format by default making it easier to publish your video to popular sharing websites, managing your videos and your files between services and devices. In Windows 8, Windows Photo Gallery is the number one way to organize, fix, find and share your photos and videos. And with advanced features like Photo Fuse and Panorama, Photo Gallery continues to bring creative enhancement to your memories. Auto Collage: Trying to create a collage of photos on your own is hard and usually requires expensive and complex software. With Auto Collage in Photo Gallery you just select seven or more photos and we’ll arrange them in a collage for you. Making a new photo our of existing photos has never been easier. Whether you want to make a special print of a collection of photos or you want a nice start or ending to a movie highlight with some of your favorite scenes. Vimeo: We’re excited to announce Vimeo as our new publish partner! Now you can share your videos straight to Vimeo from both Photo Gallery and Movie Maker. Once you have your project saved and are ready to share it with the world, just click on the Vimeo button in the share gallery, choose from a variety of options that Vimeo provides and you’re done. Now your movies can become a part of an ever growing community of film makers who call Vimeo their home. We’re hope you’re as excited as we are about the new Windows Movie Maker. We’ve listened to your feedback and have added better audio support and finer control within the storyboard. Our new music partners make it that much easier to bring your videos to life with great music that is optimized for making movies. With video stabilization from Windows 8 and other features that help you refine and share your creation, Movie Maker brings you one step closer to being the awesome filmmaker you always knew you were! For more information on what’s included with Photo Gallery and Movie Maker, click here.